The objective of Beauty Plus Academy is to provide the best quality education for our students. We will strive to develop you into a competent micropigmentation specialist in a safe educational environment. Our program is designed to ensure that you are prepared to meet all necessary requirements to become professional in the field of micropigmentation. Physical appearance has a critical impact on people’s lives every day. No matter what gender, nationality, or age we all want the be successful and loved. Natural attractiveness will bring increased self-esteem and confidence; necessary ingredients for success in your career and in your personal life. Some women and men suffer from a medical conditions, aging, or other body imperfections that may result in feelings of unattractiveness and diminish the level of happiness in one’s life. An investment in permanent makeup will provide the high returns. You can save time and money – no need to struggle to apply conventional cosmetics to your skin, and no need to buy expensive cosmetics that rub off, smear, smudge and disappear after hours. In addition, permanent makeup saves you the embarrassment of smeared, smudged eyeliners and brows so common with mascara and pencils or powders. Permanent Cosmetic procedures are also known as a Cosmetic Tattoo, Permanent Makeup, or Micropigmentation was invented to improve upon people’s innate beauty by enhancing your natural look. 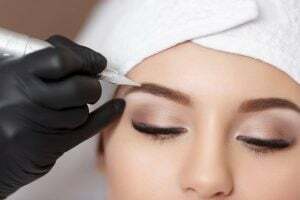 Permanent Makeup is the combination of the art and science of implanting pigmentation color into the dermal layer of the skin by using high technology equipment. Permanent Cosmetics has been a fast-growing segment of the beauty industry for the last ten years and continued growth is expected. Currently the demand for Permanent Makeup, or Micropigmentation procedures is surpassing the supply of qualified technicians. There are many job opportunities in this field. A career as a master beauty technician will provide the rewards of making people happier and more successful as a direct result of your efforts. At Beauty Plus Academy, we are committed to providing the best training through excellent Certified Trainers using a strong Curriculum in each training course of: Fundamental Course, Master in Facial Micropigmentation, Full Professional in Dermapigmentation, and Full Professional in Micropigmentation. To ensure the success of our graduates, We also offer different Business Services to assist them in Studio setup, website and social media development, marketing materials, and business consulting from startup through ongoing operations. We offer private classes for individuals and small groups to fit your date and time schedule. Online study is a good option for learners who are not able to come to the physical campus to study. The same curriculum, same deep of instruction, same text books is taught by our certified instructors. It is flexible to fit into your current study or work schedule. Each student works on live models after developing skills on practice skin. We can arrange the models or students can bring their own.